Gelatin silver print. Image is soft to the point of being blurry. Probably taken out of focus. Standing group portrait of 19 African American men, posed on stairs under a brick arch. Two men in rear hold and display a banner reading “Alleppo Shrine Cleveland, O.” with a Shrine emblem, on which the scimitar is awkwardly long. All of the men are in suits, or are in dress shirts and ties. 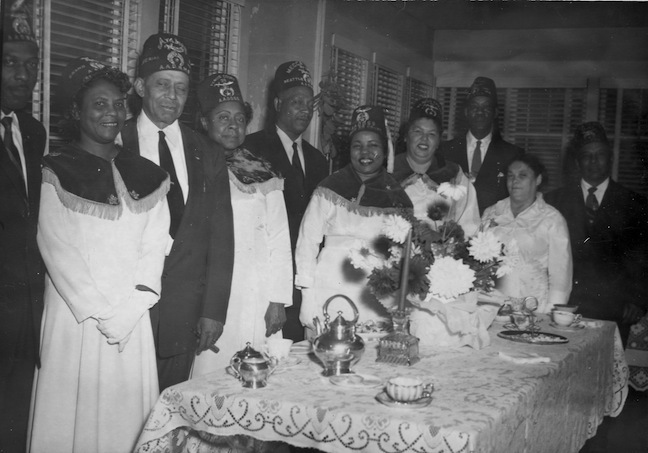 Several of them wear Shrine fezzes that read Alleppo, as well as sashes across their chests and Masonic aprons. LC, one man wears a trillby hat and perhaps some badges, but no other obvious regalia. A couple of men, R, are in suits only, no particular regalia. Certainly a Clandestine group. not only for their odd mixture of Masonic and Shrine regalia; but the AEAONMS Temple in Ohio is Sinai No. 59, and there is no hint of any “Alleppo” (also, odd spelling!) Temple in the AEAONMS history or rolls. Gelatin silver print on reasonably heavy Agfa-Browning paper. Five men in suits and fezzes and five women in white dresses, four of which are wearing fringed collars and fezzes. The men’s fezzes come from a variety of Temples. Legible fezzes inlclude Ara[rat?] and Mecca [____]. On the Ara[rat?] fez is visible the word “Imperial” and on the Mecca [____] fez can be read “Grand,” suggesting that these are national officers of whatever Shrine obedience is represented. All of the men’s fezzes say “AAONMS” across the brow. The women’s fezzes all seem to read “AAOOSS” across the brow, and one of them can be seen embroidered with “Venus Court 39” above the emblem. 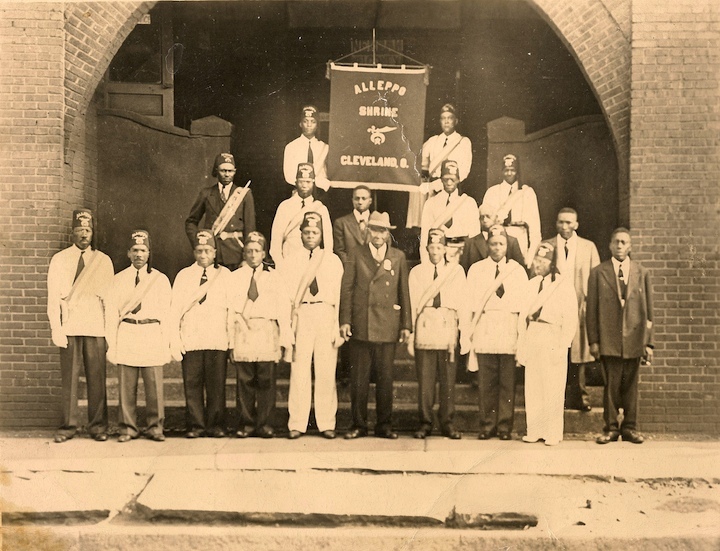 I believe that these are clandestine Shriners, because AAONMS fezzes do not have the acronym embroidered on them, and this photo comes from long before Masonry was racially integrated. I am uncertain what AAOOSS stands for, but their use of the Shrine emblem, and on (ostensibly) red fezzes for women also suggests clandestine use.